My friend Sean and I made our first batch of fruitcake in 1995; I was 16 and he was 17 years old. It started as a joke. See, we had this theory that nobody actually ate fruitcake, they just hung onto it for a while and eventually re-gifted it. We wanted to see how long it would take before we got one of our own fruitcakes back, so we set about making some. Our plan backfired horribly for two reasons: It turns out that people not only eat our fruitcake, they freaking love it. Also, people assumed that since we make fruit cake we must also love fruit cake (not true, folks!) and they’ve started gifting us with fruitcakes of their own. We knew so little about fruitcake making that first year. And, we were terrible at math. We drastically overestimated the quantities of ingredients we’d need, and schlepped about a three year supply home from the local grocery store. It’s a good thing that fruit cake ingredients practically never go bad. We made mistakes nearly every year. The first year, we didn’t know that there was such a thing as ‘candied citrus peel’, so we spent ages peeling lemons, grapefruits, and oranges and tossed the peel into our fruitcake batter. The cakes were slightly bitter, but people loved them. One year we accidentally dropped an entire egg into the whirling food processor, shell and all. We stopped and tried picking out the fragments of shell, then looked at each other, shrugged, and turned the machine back on. The recipe calls for grape or pineapple juice, but we always used whatever kind of juice we found in Sean’s mom’s fridge (though we did draw the line, after serious consideration, at using tomato juice). You’re supposed to wash and then dry the raisins and currants, a process which takes hours. We may have done this twice and then gave it up. Apparently you’re supposed to make fruitcake months in advance and let them cure; we’ve made them as late as December 23rd. People loved every single one of those cakes. In the early years fruitcake production took us close to an entire day. But we’ve become older, wiser, better, and more efficient at making fruit cake. We’ve switched to buying the ingredients in exact amounts at a local bulk food store. We’ve switched from cutting up and buttering brown paper bags to parchment paper. We’ve discovered pre-chopped dates! We know our respective jobs well, so we set out a giant “Make Love, Not Fruitcake” button on the counter, and get going. We’ve got this thing down to a science and can now churn out a double batch of fruitcake (yielding about 20 cakes) in a matter of a couple of hours (not including cooking time). A few years in (once we had both reached legal drinking age, of course) we decided it was time to start soaking our fruitcakes in brandy. We bought the cheapest brandy we could get our hands on and worked like this: one for the fruit cake, one for Sean, one for the fruitcake, one for me. On one thoroughly brandy soaked taxi ride home I attempted to tip my cabbie with a fruitcake. He awkwardly declined. The only year since we started making fruitcake that we didn’t make any was in 1999, when I was living in New Zealand and Sean decided he wasn’t going to make fruit cake without me. The people were massively disappointed, so the next year we upped to a double batch and have made a double batch every year since. Now, since I’ve moved to Sweden making fruitcake has become a bit of a logistical problem and I’m sorry to say that unlike last year when we were organized enough to make them while I was in Vancouver in August, this year it didn’t work out. It’s entirely my fault; I was only in Vancouver for brief moment this summer for my sister’s wedding, and I didn’t get around to organizing fruit cake day. I emailed Sean to see what he was going to do about fruitcake this year and he replied, sadly, that for the first time ever he’d do it alone, but he’d only be making a single batch this year. I got a text from Sean yesterday letting me know that the fruitcakes were done, and he was going to take a fruit cake round to my dad, a fervent fruitcake fan. To appreciate the sweetness of this gesture you need to know that Sean and my father, who Sean used to call (to his face) ‘Oscar the Grouch’ had a bit of a tumultuous relationship over the years. Sean, one of my oldest friends, used to drive my father around the bend torturing our family dog, making my little sister cry, and dressing up as my dad, among other things. And now, all these years later, he’s making the effort to take a fruit cake to my father. And that is what it’s all about, folks. 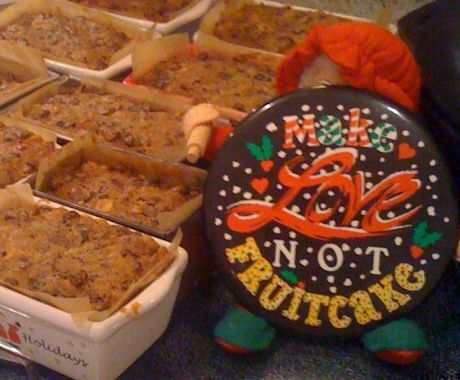 It turns out all this time we have, in fact, made love, not fruitcake.